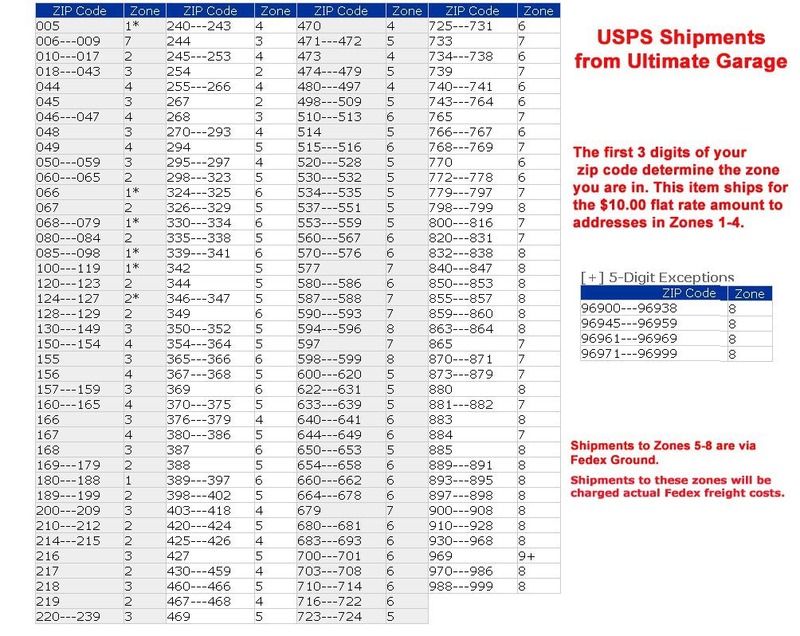 Flat $10 shipping on most US orders shipped via USPS Priority (zones 1-4)....see details below. Alaska & Hawaii orders that will NOT fit in USPS Flat Rate Envelopes or Small/Medium Flat Rate boxes are subject to additional shipping cost. Canadian and other non-US orders by phone only. Orders can be submitted by phone (201-262-0412), email ( steve@ultimategarage.com ) or through the Online Store. Local customers may make arrangements to pickup their orders at my location in Emerson, NJ. Special orders for products and quantities not stocked in our NJ warehouse will be charged in full when the order is placed. Cancellations are subject to a 60% stocking fee (I will have to put these items in inventory) plus any freight costs incurred by Ultimate Garage. If you do have a cancellation, please let me know within 24 hours so I can try to cancel with the manufacturer. Ultimate Garage now accepts orders from outside the US (by phone or email only). Payment will be required via Paypal or wire transfer. Currently shipping to...US (50 state), Canada, UK & mainland Europe, Australia, and Japan. Prices are in US dollars. All pricing is subject to change without notice. I will not sell or submit your data to any third party. Cookies are used to enhance the site and make it more convenient for customers who re-visit the online store. This cookie can easily be denied or erased through your web browser. All online transactions are 128-bit encryted and secured with an active SSL certificate. UItimate Garage accepts payment via Visa, Mastercard, Discover, American Express and Paypal. The online checkout with the credit card payment option will prompt you for account name and billing address, account number and expiration date, the security code from the card and your telephone contact information. International orders (see above) that cannot be properly "address verified" will have to be settled through Paypal or wire transfer remittance. If you prefer to pay via check, an invoice/quote will be emailed or faxed to your attention. Check or money order should be payable to Ultimate Garage . Check orders are subject to processing delays. A $35.00 fee will be charged on any returned checks. ACH Discount - there is an additional 2% discount for payment for orders via ACH (bank transfer). This applies to phone orders only in excess of $500 and the discount will be reflected on your invoice. You'll receive an invoice via email, click "Pay Now" and follow the instructions. This service is administered via a Quickbooks secure site. Effective Oct 1, 2018, I've started tracking online and phone sales by state. Under the new tax laws, the Nexus threshold in most states is either $100k/$200k in annual sales or 200 annual transactions (per state). Unfortunately, in Oklahoma, Pennsylvania and Washington, this threshold is a mere $10,000 in annual sales. I've shut off sales of big ticket items (eg, phase converters) to customers in these 3 states and will be forced to cap year-to-date sales at $10,000 (per state-OK, PA & WA) to avoid the requirement to collect, file and remit sales tax. Ultimate Garage sales and shipments to customers in other states (except here in NJ) should continue to be free of sales tax although it's likely your state will ask that you file and remit "use tax" on your purchases. Most stock items are shipped from my NJ warehouse via USPS Priority in Flat Rate shipping boxes for $10. If you require expedited delivery, your order can be shipped via USPS Express or Fedex air at additional cost. Please let me know when placing your order (by phone, email or in the order comments) so we can upgrade your delivery service. Orders in excess of 4 lbs that will not fit in any USPS Flat rate box, shipping to customers in USPS zones 5-9 (see chart below) are subject to additional shipping costs. Orders in excess of 30 lbs, regardless of location, will be charged actual freight. I can use your Fedex account number if you'd like to charge the freight to your business. We are not set up with UPS. Sample Fedex billing of a 4 lb shipment from NJ to the West Coast with Dimensional, Fuel, Residential and Rural area surcharges (actual freight cost, even with Fedex discounts, is $30.00). Due to the size of the box required (16x12x10"), this 4.2 lb package was rated/billed as 14 lbs. Tracking numbers are emailed with all shipments. Higher value orders (ie, $500+) shipped via Fedex will require a direct signature upon delivery. You can now elect to waive the signature requirement on orders $500-1000 in value by completing and returning the Shipment Release Authorization. Otherwise, if Fedex cannot get a direct signature, they will not leave the package. Customer is responsible for any re-delivery charges. If you live in an apartment complex or location with high risk and/or a history of package theft, a "signature required" shipping option is available for $5.00 additional cost (packages with a value of $500+ will automatically require a signature). This option has become necessary as Fedex and USPS insurance covers damage but not theft. Air shipment (Overnight, 2nd day, and 3-day Fedex service) is available at additional cost. Shipping cost to Alaska, Hawaii and International addresses will be quoted in advance and applied to your invoice when the order is processed. I will try to use USPS Flat Rate priority boxes when possible to keep the shipping cost to a minimum. Shipping Errors - If an item is sent in error, it must be reported within 72 hours of receipt. Ultimate Garage's liability for return shipping cost is limited to the amount charged with the original purchase. In most cases, this reimbursement is $10.00. Check the cost on your invoice. 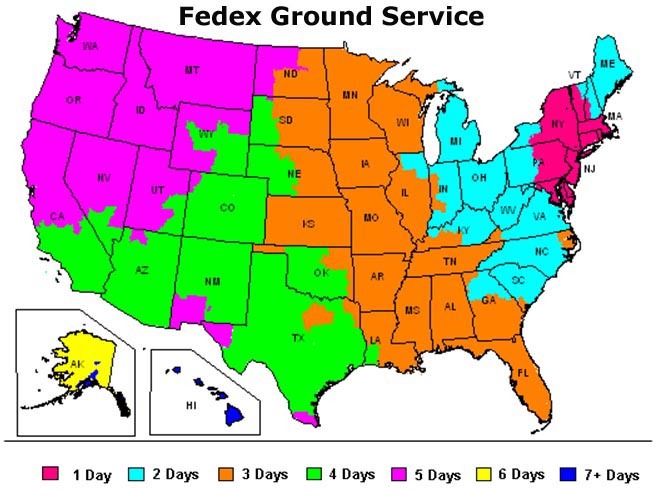 Since most orders are consolidated and packed by Ultimate Garage in NJ, a FedEx or USPS tracking number will typically be generated on the day your order is processed so that you may track your order online. High value items will require an adult signature to verify their delivery. Most orders ship within 24hrs of being received and a tracking email (for Fedex and USPS shipments) is sent to the email address submitted with your order. If the shipper's online tracking status indicates your package has been delivered and you have not received it, please let me know immediately. The shipper may be able to recover a mis-delivered item if notified within 24hrs of the "delivery date and time" shown on their online tracking page for your package. If you've received your order and there are Shortages, Incorrect Items or Damaged items, these problems must be reported within 72 hours . All original boxes must be retained for carrier inspection of damage claims. Ultimate Garage will NOT accept any Loss claims after 30 days from the date of purchase. However, you can still file with USPS directly 15-60 days from the purchase date. You can file directly with Fedex for non-delivery within 9 months of the original shipping date. I will not accept unauthorized returns. No returns on electrical items, publications or special orders. No returns on USED items. All returns must be in the original packaging and will be subject to a 20% restocking fee. No returns after 30 days*. Freight costs will not be refunded....actual freight costs incurred by Ultimate Garage with the original purchase will be deducted from any refunds. This may be substantially more than the $10 flat rate charged, especially for large, heavy or high value items. Refunds can only be issued against the credit card used for the original purchase. *Store Credits - some items returned after 30 days may be eligible for a "store credit" . All store credits must be applied to purchases within the same calendar year. The credit will be considered expired after the end of the year. Most products carry the manufacturer's warranty but the claim must be initiated through Ultimate Garage. Ultimate Garage is NOT responsible for shipping costs or labor reimbursement on items submitted and/or replaced under warranty. Ultimate Garage will NOT warranty or provide technical support for products purchase through a different vendor. Parts - most new BMW parts purchased carry a 1 year warranty. There is no warranty on electrical parts or consumable items (eg, brake pads and rotors) unless they are found to be defective upon receipt (claim must be reported within 7 days of receipt). Alto/Wap Vacuums - 1 year warranty on labor, 2 years on parts. Claims should be submitted through Ultimate Garage. Facom warranty is through the factory and may require sending the tool back to France. As an alternative, Ultimate Garage will replace broken Facom tools from stock on a limited cost exchange basis. Small items like non-impact sockets and screwdrivers are replaced at no cost if shipped with new tool orders. This is typically cheaper and much faster than sending the tool back to France for replacement. USAG warranty is through Ultimate Garage. Typically, a photo is required of the broken tool and a replacement will be sent. Tools with a value in excess of $30 will have to be returned to Ultimate Garage for assessment, repair or replacement. I will only handle warranty on Facom & USAG tools purchased through Ultimate Garage ("Proof of purchase" is required).